I’m also pretty sure a very large percentage of gardens have hummingbird feeders. Who doesn’t love hummingbirds? I absolutely do and my garden certainly expresses that! For the longest time I held off adding a hummingbird feeder to my garden. I felt it was cheating to attract them using anything but plants and flowers. I’m stubborn like that. Also, I didn’t really feel like they were garden decor or yard art. I was wrong….. When I discovered hand blown glass hummingbird feeders, my stubbornness changed its willful tune. 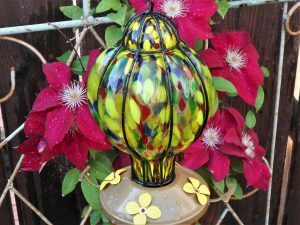 A glass hummingbird feeder is gorgeous and very creative garden decor. You will never tire of watching enchanting hummingbirds in your garden. You will also love gazing at the feeder as well! The colors on my glass hummingbird feeder are so deep and rich. I love the way the sun hits the colored glass. This unique hummingbird feeder is about 9″ tall and 5″ in diameter. Its creative shape kind of reminds me of a hot air balloon. It also came with an “S” hook hanger that will make moving the feeder around a little easier. I love garden decor that is easily movable according to my mood and change of seasons. I think a nice sturdy Sheppard’s hook is ideal for this glass hummingbird feeder. I’m so thrilled I received this as a gift. First of all because it was so thoughtful and I love thoughtful gifts. Second reason is, if I had to select one on my own, I’m not sure I could choose. 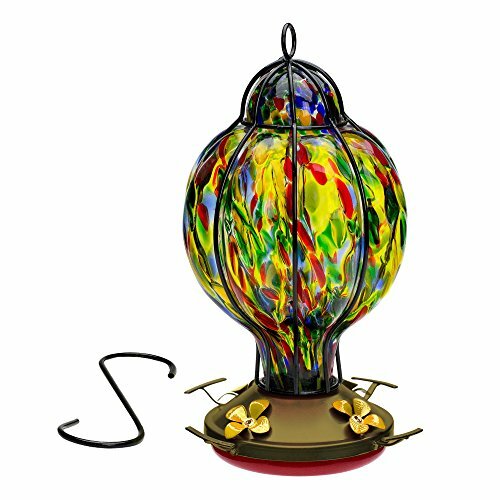 All of these hand blown glass hummingbird feeders are so very cool! Having this hand blown glass hummingbird feeder creates a new mission for me. I absolutely have to capture a hummingbird or two feeding with my own camera. I can’t wait to share it with you. Since hummingbirds are drawn to color, particularly red, a glass hummingbird feeder is a sure way at attract the little fellas. 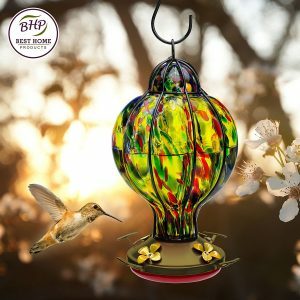 Colored Glass, Garden Art, Garden Decor, Garden Decor Gift Ideas, Gifts for Gardeners who have Everything, Hand Blown Glass Hummingbird Feeders, Yard Art.